I’m not going to lie: ECDX was a challenge for me. I have this habit of putting really high standards on myself, and putting too much pressure on myself to perform. Then, when the team needs me in a different capacity than expected or something happens to change the way the game goes (compared to what I envisioned), I become stressed. I beat myself up. I make it harder to compete at that high level I hold for myself. The whole cycle can get utterly ridiculous. We all play a mental game when we step onto our track. How we perform depends on a myriad of outside forces not limited to how much sleep we got the night before, if our trucks feel tighter than normal, if we’re unsure what wheels to use and even who may or may not be watching us in the crowd. The ability to shut off the receptors to the outside world is the first step to mental game dominance. Figuring out a bout day routine that you can take anywhere will help you prepare for the challenges ahead. So many of us create routines that rely on the comfort of a home bout; you need to be able to perform your warm-up (mental and physical) in any arena, at any time of day. You are not preparing for an opponent. You are preparing to overcome your own physical limitations and to play the best game of your life. Preparing mentally takes just as much practice as preparing physically. Many of us ask the question, “How do we play a better mental game?” But few of us consider the repetition involved with developing it. Mastering your mind, creating preparation routines to set yourself in the right frame of the game and then stepping into each jam with clarity and confidence – that is what we aim to do. This game is supposed to be fun. 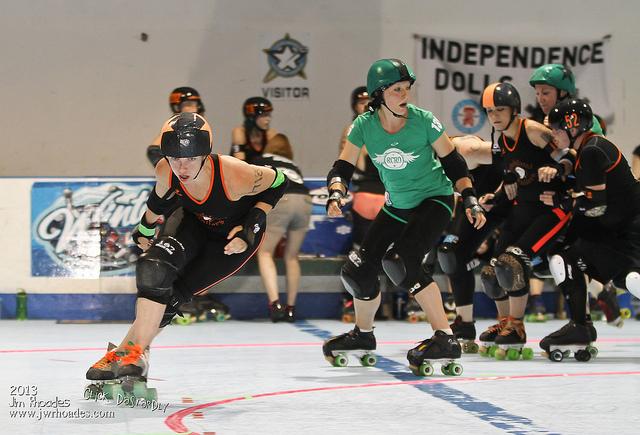 The physical nature, the mental challenge and the constant motion of the game is what every derby skater craves. Doing it to your highest limit, and even surpassing what you thought was possible – that is what we strive to achieve. Overcoming our own internal limits to accomplish a physical feat is what we all train daily for. So now back to the self-destruction. Stepping on the track tired, dehydrated, irritated, without proper mental prep, worried about an injury, etc etc etc will cause you to spiral out of control. Create triggers in your head right now so that if those things are happening to you as the game approaches, you can stop, reset and re-invent your mindset. At first, you may need a team mate to snap you out of it. When that moment of realization of game day-crankiness occurs, stop. Acknowledge. Think about how you feel. That way [if there is] the next time, your own internal alarm will trigger and you can get your mindset right before disrupting your own gameplay or (worse) the mood of your team mates. This is my challenge: understanding that I am better than I believe, that I can do more than I think and that I am quicker than my opponents. My challenge is to not be concerned that a motion is going to hurt me, and that I am going to break the pack. 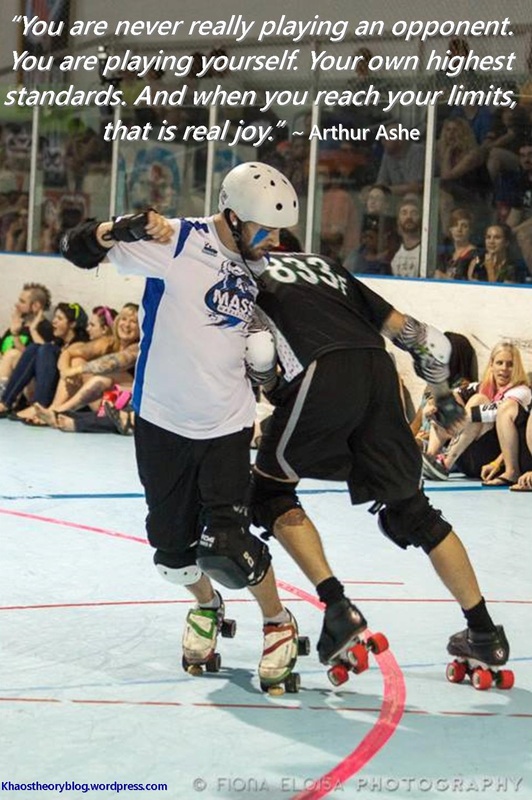 My challenge is to always have a smile on my face, even if I don’t play as much as I want to; even if my team needs me in a different capacity than I want to play. This is why ECDX was tough for me. I did not have my mental game in order. I did not go through my routine and I did not understand that I wasn’t going up against an opponent. My challenge is to go up against myself, play to my limits and savor the joy of that 25 point jam with the team that loves and supports me as much as I love and support them. Great Quote! I may steal it lol! And congrats on being able to push yourself beyond yourself!